Have you noticed how chilly it is outside? I have too. We’ve turned on the heat in out home, but sometimes I’d like a bit more warmth. This neck warmer is the perfect item to keep you warm on those extra chilly nights, and when I use a neck warmer I don’t need to turn the heat on too high (a.k.a. save some money). This neck warmer is so comfortable and I love it. When I heat it up the warmth lasts for about 20 minutes. That’s pretty amazing. 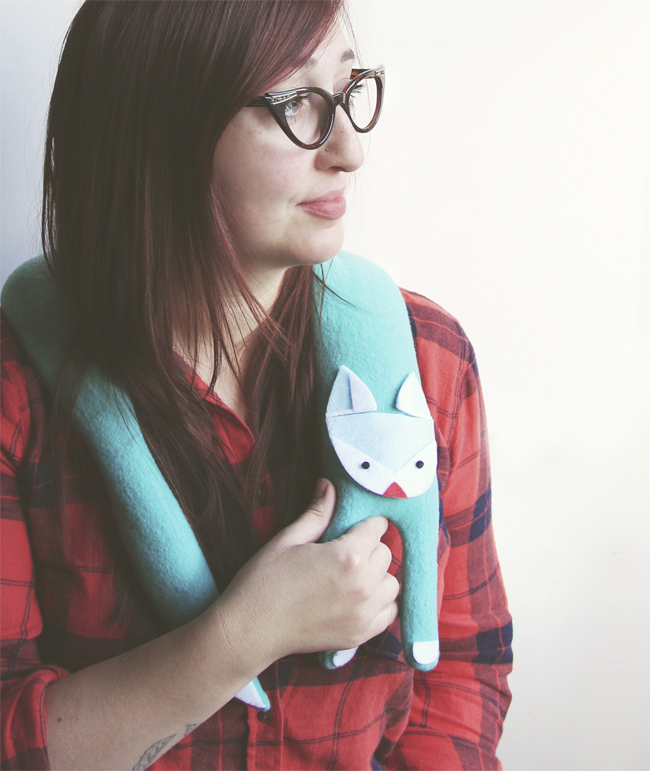 Add one of my gift tags to the neck warmer and give to one of your favorite people this holiday season. 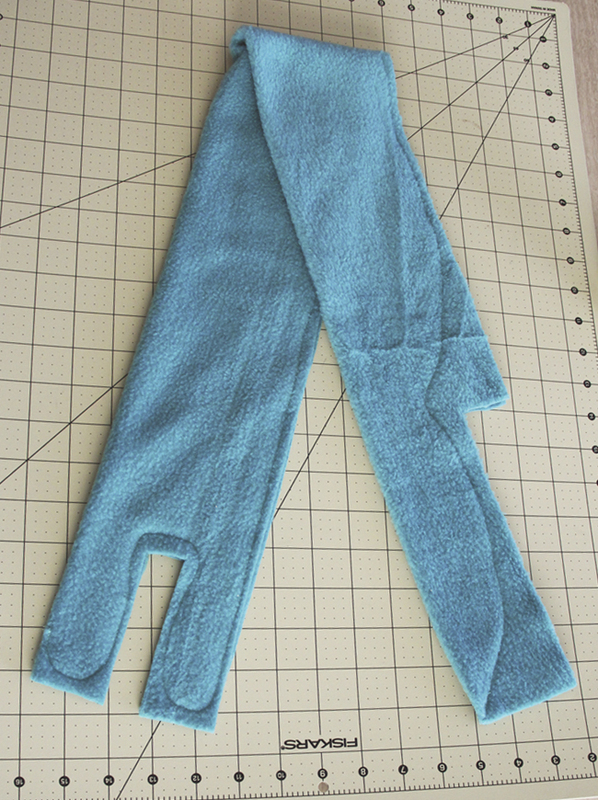 Cut out a 40 inch by 9 inch section of fleece. 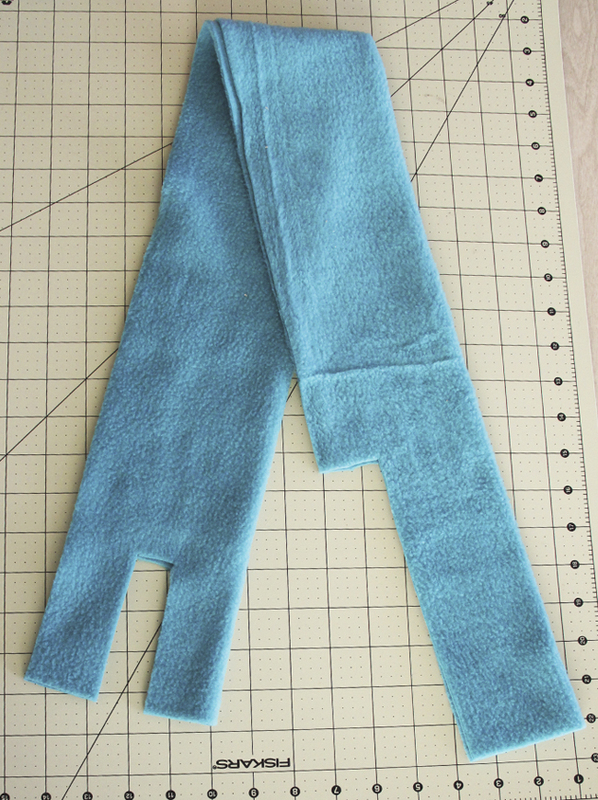 Fold in half, the long way, and you should now have a 40 inch by 4.5 inch section of fleece. At one skinny end, cut out the two arms. 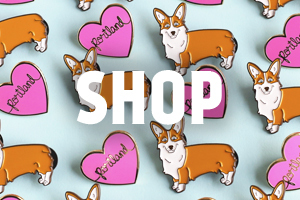 They should be around 4 inches long by 1.75 inches wide. 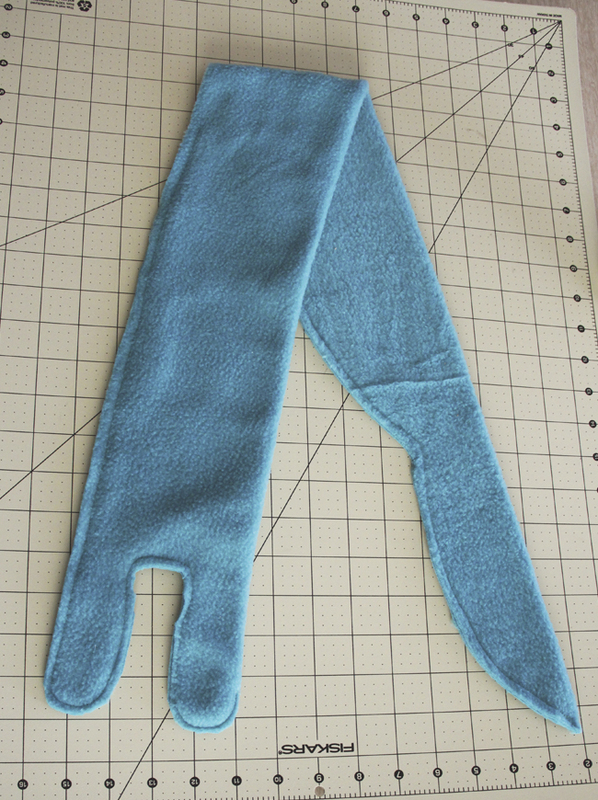 On the opposite end, cut out an 8 inch long by 3 inch wide section for the tail. Time to sew up the fleece! Leave about a quarter inch seam around the whole piece. When you sew up the front feet, I suggest rounding the feet. 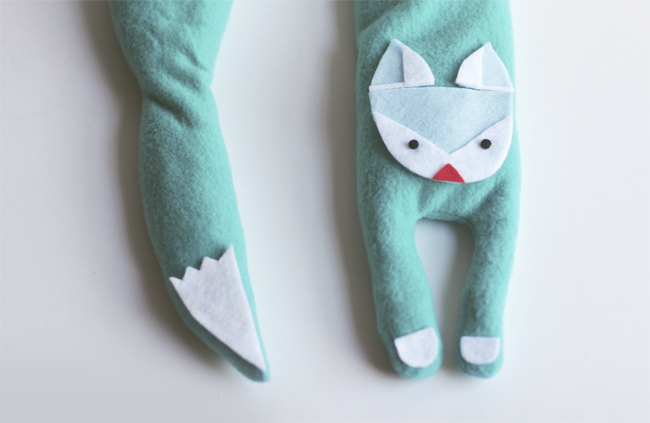 When you sew the tail, sew it into a pointy tail shape. Tip: be sure to leave an opening so you can flip the fleece inside out. Trim the excess fleece along the sewn edge. Flip the piece inside out. I suggest using a chopstick to push out the tail and feet. Use a funnel (or a rolled up piece of paper), to fill the fox with rice. I used about 5 cups for my neck warmer. Sew up the opening with a thread and needle. Tip: don’t fill the fleece too full, or it won’t sit around your neck as well. Let’s add a face to this little neck warmer! Freehand cut out a face, ears, and nose from the colored fleece. Use the fabric glue to attach the face above the legs. Then, cut out a section to glue onto the tail. Let the glue dry completely (I waited overnight). 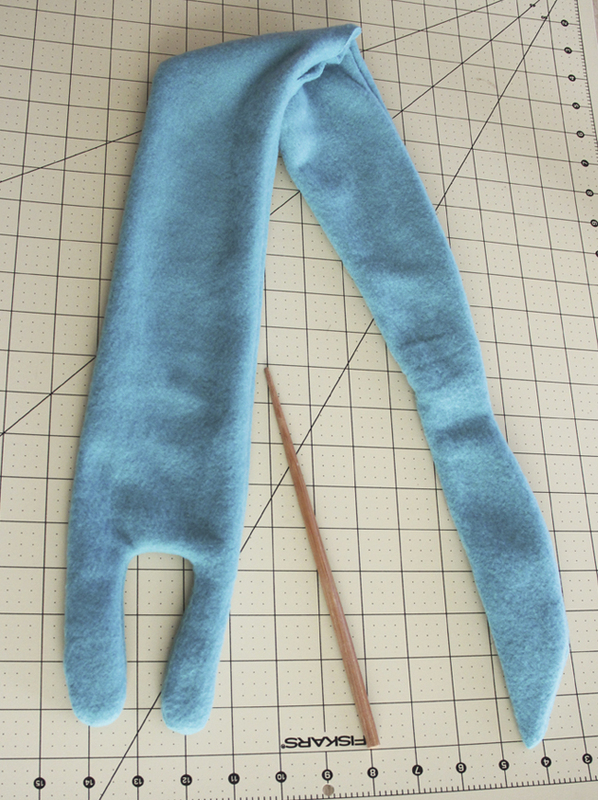 Tip: I suggest doubling up the felt for the ears, face, and tail (just so the fleece doesn’t show through the felt). 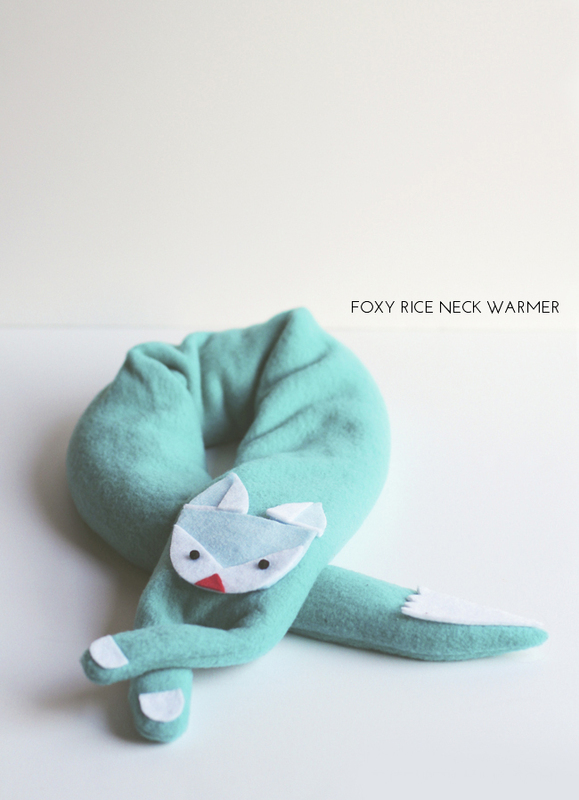 To warm up your lovely rice neck warmer, heat it in the microwave for about 1.5 – 2 minutes. 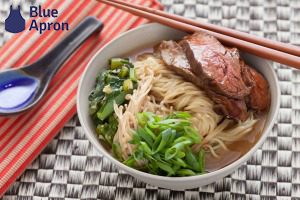 If it’s not warm enough, heat it up for another 20 seconds and check again. 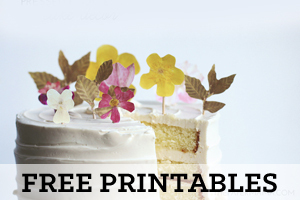 If you want some more energy saving tips, check out this money savers tool (comes with a rebate), look at this rebate catalog for appliances, and look at some cool energy saving vehicles. 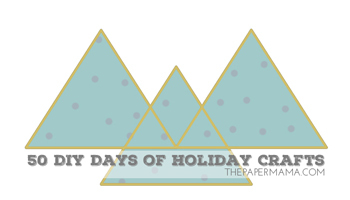 To see the other 50 DIY Days of Holiday Crafts, check out this link. This is so cute! I love that colour btw!